Venezuela's self-declared interim leader Juan Guaidó has arrived back in the capital, Caracas, to a rapturous welcome from thousands of supporters. "They threatened us and here we are, putting forward our face for Venezuela," he told a huge rally. Mr Guaidó - who heads the opposition-led National Assembly and proclaimed himself Venezuela's acting president after the legislature declared Mr Maduro's May 2018 re-election illegitimate - has been recognised by more than 50 countries. Mr Maduro, who is backed by China, Russia and Cuba, insists he is the only legitimate president. Venezuela's political crisis has been sparked by an economic meltdown in which hyperinflation has hit salaries and savings, leading many to flee the country. 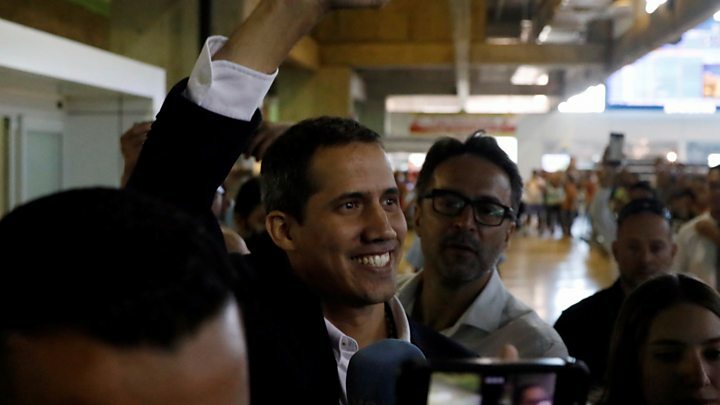 Mr Guaidó was received at the Simón Bolivar International airport by diplomats from the US and EU nations and a crowd of supporters who chanted "Guaidó, Guaidó" and "Yes we can". After saying that he had been threatened with "jail, death" before his return, Mr Guaidó said he had been treated well on his arrival at the airport. He said immigration officers even greeted him at the airport with the words "welcome, president". "It is evident that after the threats, somebody did not follow orders. Many did not follow orders. The chain of command [in the government security forces] is broken," he told the crowd. "On Saturday we'll continue in the streets, all of Venezuela will return to the streets, decided and determined to mobilise in search of their freedom. We will not rest one second until freedom is achieved." Juan Guaidó's car could barely move in the final few streets towards the rally. And the noise that greeted his arrival when he took to the stage was deafening. What will have pleased those supporters most wasn't just that he was back on Venezuelan soil, but the nature of his entry. Rather than slipping in over the border in the dead of night, he walked straight up to immigration in the main airport in Caracas and back into the country. As for Mr Maduro, he finds himself in a difficult bind. Having watched Mr Guaidó thumb his nose at the Supreme Court's travel ban and at his government more generally, he must decide whether to arrest his opponent for leaving the country. He will be fully aware that Washington has repeatedly warned him against doing so and that the potential consequences would be serious. Shortly before his return on Monday, US Vice President Mike Pence sent a warning to Mr Maduro, saying any threats against Mr Guaidó "will not be tolerated and will be met with swift response". US Secretary of State Mike Pompeo later reinforced this view later, congratulating Mr Guaidó on his "successful diplomatic efforts in the region and safe return to Venezuela" in a statement. "The United States and freedom-loving nations around the world stand with interim president Guaidó, the National Assembly and all democratic forces as they work to establish free and fair elections that will return democracy to Venezuela," he added. "The international community must unite and push for the end of Maduro's brutal regime and the peaceful restoration of democracy in Venezuela." EU foreign policy chief Federica Mogherini has said that any measure that put at risk Mr Guaidó's "freedom, safety or personal integrity would represent a major escalation of tensions". Diplomats from the Lima Group, a bloc of 14 Western countries created to tackle the Venezuelan crisis, has said that "serious and credible threats" had been made against the life of Mr Guaidó. It said "any violent actions against Guaidó, his wife, or family" would be met by all "legal and political mechanisms". While international pressure on President Maduro has steadily increased, the Venezuelan leader has dismissed all calls for him to step down and denounced them as attempted coups d'état. Image caption President Maduro says that he is facing "imperialist aggression"
While this is a sign that lower-ranking soldiers are suffering the same hardships - shortages of food and medicine - as the general population and are willing to follow the more than three million people who have left Venezuela over the past years, there is no sign yet of a general switch in loyalty.